The Golden Arrow Lakeside Resort is a full service completely non smoking resort. Guests enjoy our indoor heated pool sauna whirlpool tubs private white sand beach complimentary boats full service restaurant health spa rec. room nightclub lounge and on premises boutique shops. We are directly on the shores of Mirror Lake and in the center of the Lake Placid which puts everything from shopping to skating literally right outside your door. All Lakefront Rooms above the ground level have private balconies with spectacular vistas. Ground level rooms have glass doors that open onto patios literally steps from the lake shore. No other hotels in Lake Placid can rival the incredible accommodations, attentive service and array of amenities offered by the Crowne Plaza Resort & Golf Club. Located in the Olympic village and adjacent to the legendary Olympic Center, our resort offers a superb location for work and play. You'll quickly see the resort's the breathtaking scenery. Our location above the shops and cafes of Main Street affords views of Mirror Lake, Whiteface Mountain and the High Peaks. 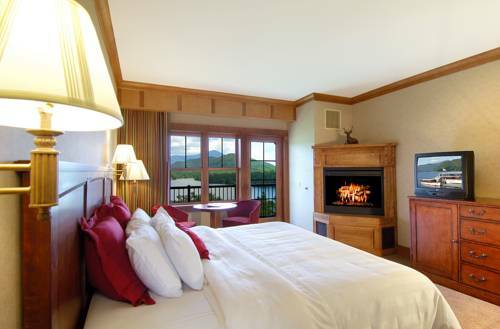 Upgrade to a lake view room and dine at our restaurants overlooking Mirror Lake. Our historic Lake Placid Club has 45 holes of championship golf. The Tennis Club and private Beach Club are perfect in warm weather. And when the snow returns, youll enjoy our Cross-Country Ski & Snowshoe Center, as well as the indoor pool and hot tub. An award-winning inn set amidst the Adirondack Mountain high peaks, Mirror Lake Inn Resort and Spa sits on the shores of the lake within eight acres of landscaped gardens. A private lakeside beach, superb cuisine and a stylish spa add to the appeal of this delightful retreat. There is a relaxing atmosphere here with a choice of rooms and suites in five idyllic lodges, all with stunning lake views and many with snug fireplaces and balconies. Indulge in an Adirondack Maple Sugar Body Scrub at the tranquil spa and emerge feeling totally rejuvenated as you breathe in the clean, crisp mountain air. Make the most of the beauty that surrounds you and take a boat onto the lake where you can fish or swim in the pristine water. In the winter you can try your hand at dog-sledding on the frozen lake or for something more conventional, enjoy skating at the ice rink. Spend sometime in Lake Placid and discover an amazing selection of speciality boutiques. The property is a Beach Motel in a resort community. 30 nicely appointed guest rooms ranging from modest Queen bedded rooms for loving couples to Concierge Kings or Double/Doubles with private terraces with ocean view second floor. Efficiency units for families or just those that wish to create their own cuisine and even a Ocean view Jacuzzi Efficiency Suite for that special occasion to pamper yourself. Luxury Property In The Heart Of 5th Avenue's Shopping District, Minutes Away From The Theatre District, 24 Hour Butler Service. A 1904 Beaux Arts landmark in the heart of midtown Manhattan, The St. Regis provides the atmosphere and attentive service found only in the most gracious residences of that era. Yet it still keeps up with the finest modern amenities, such as High Speed Internet Access available in all guest and meeting rooms. Concept design hotel embracing the 'waking dream'. Guest rooms designed in Dream inducing blue tones and light with the most up to date of Amenities including 37/42 inch Panasonic Plasma Televisions, Working Desks with ergonomically integrated ports for hi-speed broadband internet access. 300 Thread count Egyptian Cotton Sheets, Kashwear Bathrobes, Chopra Products. Located in the heart of New York's Entertainment and Media District. 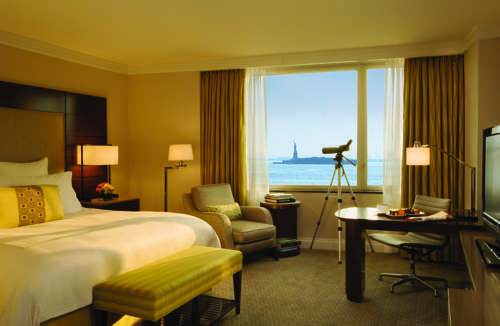 The Ritz-Carlton New York, Battery Park, is the only luxury waterfront hotel in Manhattan. The 39-story, 298-room art-deco inspired hotel overlooks the New York Harbor, Ellis Island and the Statue of Liberty. Inside the hotel, a flawless standard of personal service reigns with bath butlers and valets, concierge service, 24-hour room service and spa treatments. 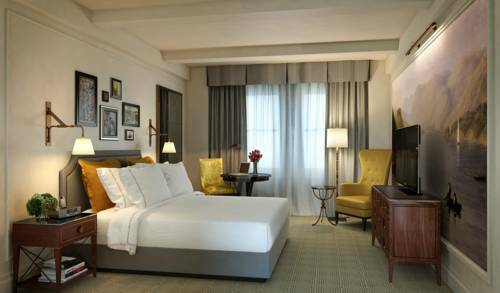 Guests venturing from the snug haven of their room can enjoy a breathtaking sunset or step outside for a stroll along the scenic esplandade of Battery Park. The Ritz-Carlton is located just minutes from the trendy SoHo and TriBeCa neighborhoods known for their great shopping, restaurants and museums. The Bryant Park hotel is a landmark architecturally significant luxury boutique hotel in the former American Raditor Building. A majority of the rooms overlook the gardens of Bryant Park. The interiors were designed by David Chipperfield. Guest rooms are minimalist by design but softened with B and B Italia oak furnishings hardwood floors colorful Tibetan rugs textured sofas with cashmere blankets and Napa leather chairs. The large picture windows attribute to the brightness of the guest rooms. Each guest room is equipped with a 32 LCD High Definition television and Bose Wave Radio and CD Player. The luxurious oversized bathrooms feature Travertine marble floors and walls with glass enclosed showers and separate deep soaking tubs with Molten Brown Amenites. Restored to its 1926 neo-Federal style, InterContinental The Barclay New York welcomes guests with residential warmth and luxury. 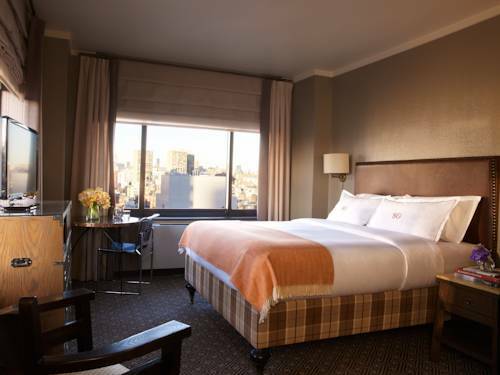 Few hotels provide such easy access to must-see attractions including Rockefeller Center, Carnegie Hall, The Metropolitan Museum of Art, Times Square and Central Park. The Statue of Liberty is a short taxi ride away. On a quiet tree lined street of the Upper East Side is where you will find the Hotel Plaza Athenee, a boutique luxury hotel nestled among genteel residences and lavish townhouses on Sixty Fourth Street between Park and Madison Avenue. Combining cosmopolitan luxury with the intimacy and services of a boutique hotel, Hotel Plaza Athenee has created a home away from home. Charming and elegant in every detail, rich in style, Hotel Plaza Athenee speaks of a more refined time and place. The classic grandeur of the Hotel Plaza Athenee welcomes with an opulent atmosphere where Louis XVI style meets Manhattans uptown chic. Hand-painted murals, noble Italian marble, French antiques and lux furnishings create our gracious haven. Located in the heart of Manhattan. 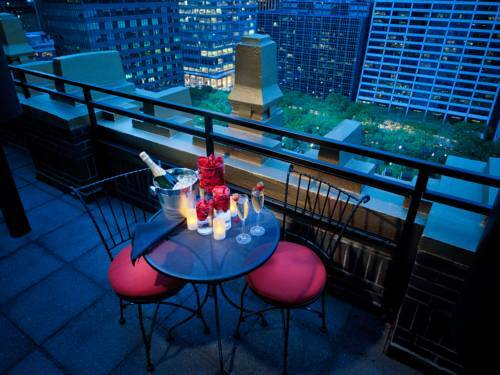 The Omni Berkshire Place is located on 52nd and Madison Avenue in the heart of exclusive Midtown Manhattan. 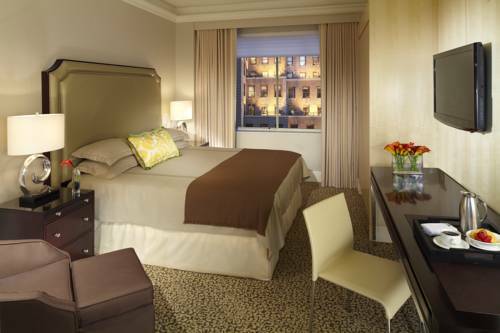 This 4 Diamond luxury hotel is just steps from exclusive 5th Avenue shopping and 1 block from St. Patricks Cathedral as well as 2 blocks to Rockefeller Plaza and Radio City Music Hall and 8 blocks from Central Park. It features 398 rooms and suites that are all non smoking with a fresh contemporary look. 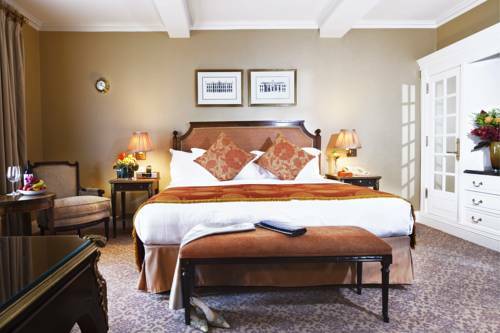 Rooms feature a 37 inch LCD HDTV as well as an English Sycamore Feature Wall with ample work space and mahogany furnishings plus luxurious linens. The Omni Berkshire Place currently resides on the prestigious Travel and Leisure Top 500 Worlds Best Hotels list and blends memorable elegance with the excitement of Midtown Manhattan. Designed as an homage to the historic Soho district the industrial chic architecture and original artwork provide a unique setting for both the creative professional and the weekend reveler. The lobby is a soaring salon above West Broadway with a classic bottle glass staircase and enormous brick columns. The Grand Bar and Lounge and The Gallery provide a variety of settings for every mood.